Unified threat management (UTM) systems are among the most widely used tools in the information security arsenal. 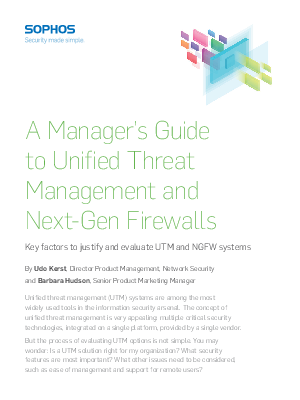 The concept of unified threat management is very appealing: multiple critical security technologies, integrated on a single platform, provided by a single vendor. But the process of evaluating UTM options is not simple. You may wonder: Is a UTM solution right for my organisation? What security features are most important? What other issues need to be considered, such as ease of management and support for remote users?